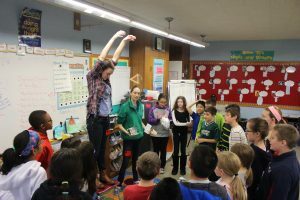 STOMP partners pairs of Tufts University students with school teachers in the greater Boston area to create and implement engineering curricula in the teachers’ classrooms. The Tufts students collaborate with teachers to bring new technologies and innovative activities to the classroom, working to meet the Science, Technology and Engineering component of the Massachusetts Frameworks in creative and engaging ways. STOMP is run, hosted, and funded through the Tufts Center for Engineering Education and Outreach (CEEO). Currently, the STOMP program engages 59 Tufts students from a variety of academic disciplines. Undergraduate and graduate student employees work between 5 and 10 hours each week, including classroom time, preparation, and weekly development meetings. Check out the 2013-2014 Annual Report for more information!